This is Elote up another notch! 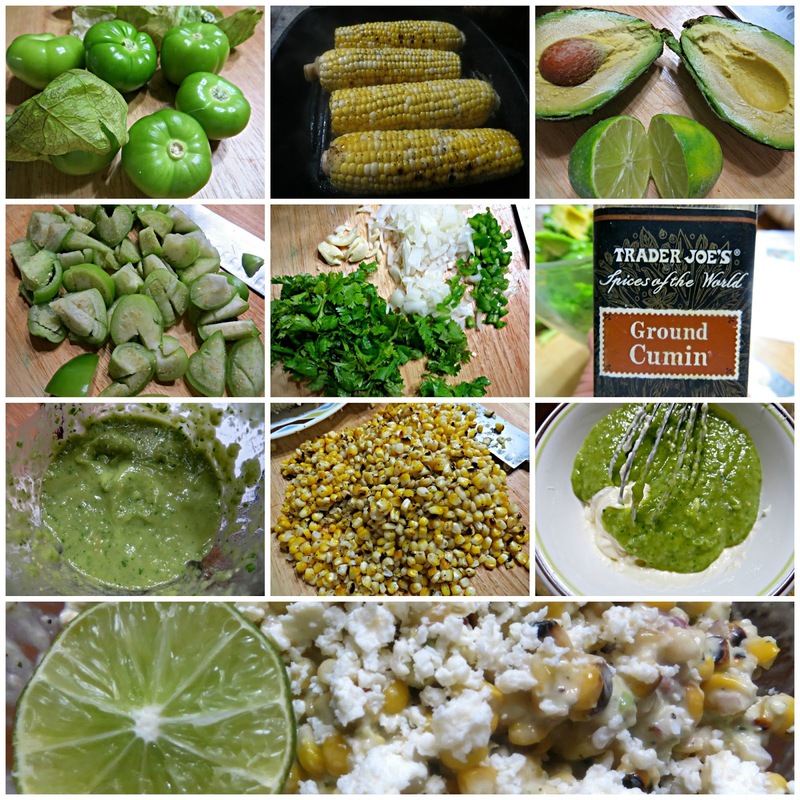 I grilled the corn, made a creamy dressing of tomatillos, avocados, onion, garlic, lime juice, jalapenos and cilantro which I whisked with a little mayo and cumin. After shucking the corn, I tossed the kernels with chopped purple onion, cilantro and more lime juice before adding the dressing, The finale of course is topping the delicious mixture with crumbled Cotija cheese for a creamy finish. It is perfect by itself or as an accompaniment to a meal. I know, I didn't even get to plate it nicely- just not the thing for eager, excited mouths. For the guacamole: Combine the cilantro, tomatillos, garlic, avocado, jalapeno, onion, lime juice, cumin and salt in a food processor or blender and pulse until combined. Set aside 1/2 cup of the guacamole for the creamy tomatillo dressing, and use remaining guacamole for another recipe. For the charred corn salad: Preheat a grill pan over high heat. Brush or rub each ear of corn with the canola oil and sprinkle with salt and black pepper. Grill the corn until it gets a nice char, 2 to 3 minutes per side. Set aside until cool enough to handle, about 5 minutes. Stand each ear stalk-end down, in a wide, shallow bowl and slice the kernels off using your knife. Combine the corn kernels, lime juice, avocado, Fresno chiles and red onions in a large bowl. 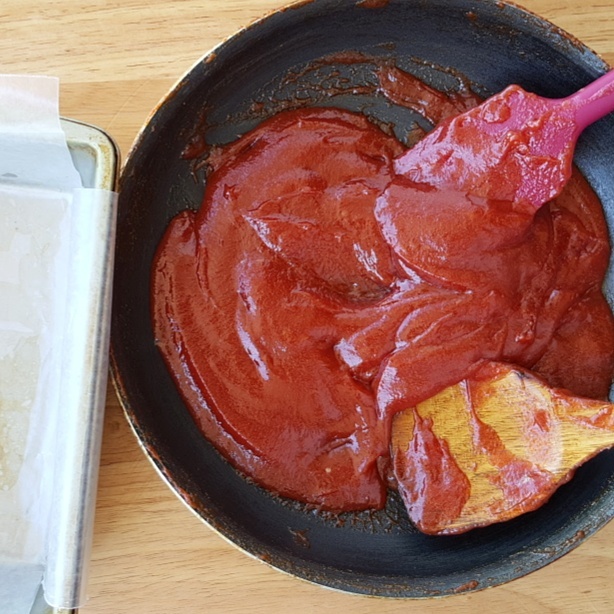 For the creamy tomatillo dressing: Mix together the mayonnaise, 1/2 cup tomatillo guacamole, hot sauce, chili powder and cumin. Add to the corn salad and toss to combine. Fold in the cilantro and crumbled cotija and season with salt. Serving suggestion: Portion the salad into small cups, squeeze additional lime over the top, and serve with a spoon. This dish screams summer and wonderful elote memories. The sweetness of the corn, the tangy and creamy tomatillo dressing with a little kick from the jalapeno and the crowning glory of elote which is the crumbled Cotija cheese. And the good thing is- this one's not messy to eat and way better with added flavors from the avocado and cilantro. This is elote turned into a salad!